This was a dramatically different debate from the first one; a concerted attack on the Conservative record. This was an opportunity for the Leader of the Opposition to, well, lead the opposition. 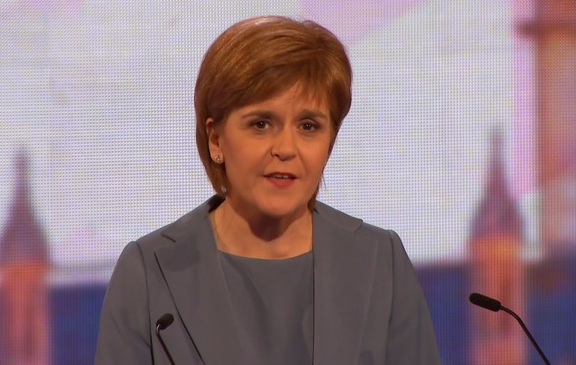 Ed Miliband (Lab) spoke as someone who would like to lead but Nicola Sturgeon (SNP) actually led. She dominated proceedings interacting with the questions and setting her case within a clear narrative for the listener to follow. Ed Miliband, despite having the vast bulk of political terrain more or less to himself, seemed determined to protect a tiny patch of what he clearly believes to be political safe ground – despite there being nobody present who wanted it. The ideas he put forward were frequently so modest as to be virtually indistinguishable from the very thing he was claiming to oppose. Of course, ‘making the lesser claim’ is a perfectly respectable tactic in both philosophy and argumentation but it usually has the corollary of proving more than that claim. Miliband failed to achieve that. From the perspective of controlling a debate that should have been his to dominate, he failed to establish a broader framework that would draw the listener to one simple and overwhelming conclusion that he had proved, more than proved, the relatively modest platform he was proposing. In short, he defined tight then failed to prove that definition. Sturgeon by contrast had a task that was in some ways harder – she had to make herself relevant in a debate where most viewers can’t vote for her – and in other ways easier as she faced very little meaningful rebuttal in the room. However, from the offset she presented the audience with a clear and discernible framework within which to make sense of her proposals. She then set out the two great pillars upon which any case stands – that it is possible and that it is necessary or virtuous. She was willing to make and substantiate bold claims that could have borne more scrutiny than they received. Last place was actually the hardest to give. Both Wood and Bennett had moments that appeared overly-scripted and as though they were stretching too little material to cover too much argument. However, to be fair, the same could be said for Miliband. Ultimately, however, Farage clinched it. His determination to be seen as a maverick now leads to a willingness to digress, offend and dissemble. He also showed a troubling lack of factual knowledge (GDP vs government expenditure for example) that would be alarming in any candidate, but is particularly troubling for the leader of a party discussing that party’s key policies.